Americans want to live healthier lives—at least, that’s the message sent by their New Year’s resolutions. Exercising more is the number one resolution for 2019, chosen by 13 percent of those surveyed, according to an NPR/PBS NewsHour/Marist Poll. That’s followed closely by quitting smoking, losing weight and eating healthier. And seniors are no exception. Older Americans are remaining more active and fit longer, engaging in exercise rarely undertaken by seniors just a generation ago. Country Meadows is an active retirement community and offers plenty of advice for seniors who want to exercise. What’s more, we provide fitness facilities at all our campuses, even for residents who aren’t fully mobile. That’s where you will find seniors enjoying and challenging themselves, often exercising to the rhythms of upbeat, peppy music. Whether living at active retirement communities or in their private homes, seniors who want to start an exercise program should first talk with a physician. Their discussion should focus on which exercises would be most suitable for them. Health issues such as reduced oxygen intake or joint problems may have to be factored into a fitness regimen. Popular cardiovascular exercises for seniors include walking, hiking, jogging, dancing, swimming, water aerobics, biking, tennis and golf. Options for balance training are stretching, yoga, pilates and tai chi. For muscle strengthening, there are elastic resistance bands, light weights, dumbbells and weight machines. We concur with AARP on these guidelines for new workout plans: Start slowly and gradually increase intensity; wear comfortable, supportive shoes; wear a pedometer as an incentive to keep moving and make exercise part of your daily routine. Also, exercise can be more enjoyable when done with a friend and when varied—not repeating the same activity every day. Seniors can do a lot of exercise at or near their own homes. Among adults who are 65 and older, walking, gardening and other yard work are among the most frequent and preferred forms of exercise. Studies show exercise is the best preventive action seniors can take to reduce falls and lower the odds of developing dementia, diabetes, heart disease and obesity. Regular exercise by older adults also helps them reduce stress and elevate their mood. That’s why at Country Meadows, each of our active retirement communities hosts a fitness program led by a full-time qualified fitness director. All campuses have fitness centers with exercise equipment, as well as grounds for safe outdoor walking in pleasant weather. 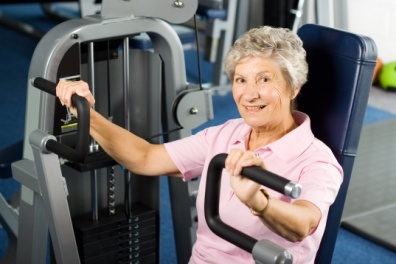 We have exercise programs for residents of all lifestyles and levels of care. Our variety of programs includes fitness, endurance, strength for balance, chair yoga, chair exercise, hand exercise, Wii bowling and walking. Most campuses offer instruction in tai chi. This Chinese meditative exercise promotes slow, total-body movement and reduces stress. Country Meadows co-workers enjoy supporting our residents in remaining healthy, fit and active. We would be glad to have you schedule a visit to any of our active retirement communities and introduce you to our full range of activities and services. We have 10 Pennsylvania retirement communities—in Lancaster, Hershey, Mechanicsburg, Pittsburgh, Wyomissing, York-South, York-West, Allentown, Bethlehem and Easton—as well as a Maryland retirement community in Frederick. If you’re in the process of choosing a retirement community near you, we invite you to contact us. Great article! Lets all live our best life in 2019! There’s no reason not to, especially with the support of fantastic women like Renee Harlow and Kim Eichinger! You’re such an asset to the program and to Country Meadows, Renee! Your commitment and your smile make a difference every day! Thank you for your kind remarks. Kim and Renee are incredibly talented individuals, and we are so grateful to have them on our team inspiring our residents! Renee truly makes a difference with our residents AND our team. Thank you for sharing such compliments–they are well deserved!